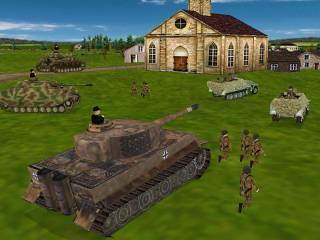 Combat Mission is a turn-based action and strategy game, depicting the fighting on the western front of World War II between the D-Day invasion of Normandy and the end of the war. It won a host of awards on its original release, and now has been further enhanced. With graphics and sound effects all in 3D, random battle generator, scenario editor, different weather conditions, seasons, and times of day, no two games will be alike. There are over 130 infantry types and 6 different armies: (Americans, Germans, British, French, Canadians, and Polish). Soldiers all speak in their native tongues. In addition, there are Paratroopers, elite units and air strikes. Each Action Phase simulates 60 seconds of real time. All units move, fire, and react as they really would over a period of 60 seconds. Moreover, you watch the action from any vantage point you choose, in beautiful 3D graphics. Zoom in or out, pan up, down, left, or right, and move the camera anywhere from a pure overhead view down to "trench cam" view. Then replay the action from another angle if you like. It's up to you, and you get to see all the action! Go into first person view, rotate to get the German perspective and watch as your hordes of infantry burst from the tree line and surge forward. See a Panzer roll around the corner and use its flamethrower to discourage infantry from remaining in that foxhole. In Combat Mission, you can experience anything from the massive Allied assault in Normandy, the race across France and the liberation of Paris, right up to the end of the war in Europe. If there is a battle that is not covered, make it up yourself with the easy to use scenario editor. Combat Mission has wide appeal. The game is intuitive and the manual is accessible enough for casual players, non-war gamers, or gamers just interested in a WWII diversion. However, it's also got more than enough meat for the serious war-game fanatics. 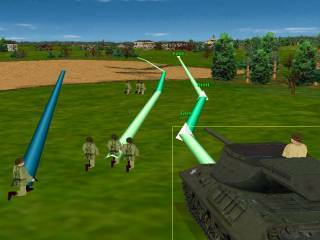 Combat Mission can be played by internet, e-mail, or hotseat. 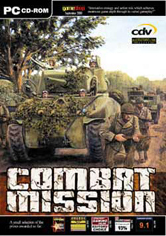 Click here to Win a copy of Combat Mission or War Commander!